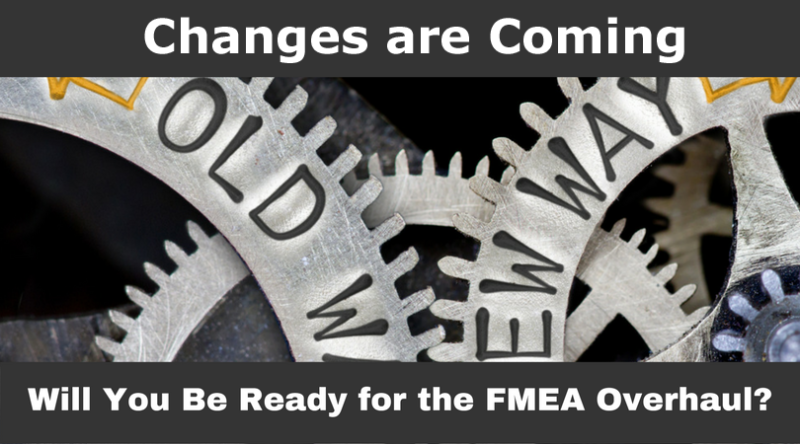 FMEA Methodology is changing in 2018. Earlier this week AIAG rolled out a draft version of the 2018 AIAG-VDA FMEA Handbook giving stakeholders 90 days to review and comment on it. The handbook is a collaboration between OEMs and Tier 1 supplier members of the Automotive Industry Action Group (AIAG) and Verband der Automobilindustrie (VDA), Germany’s association for automotive manufacturers and suppliers. It represents the culmination of a three year project completely revising FMEA methodology. The result will be one common foundation for FMEAs across the global automotive sectors represented by AIAG and VDA. After a quick first review of the new FMEA methodology, rumors we have been hearing that the changes are substantial appear to be true. We like that there will be a common methodology worldwide and that it brings together the best FMEA practices that have been used around the globe for decades. We also like the tone of the document that makes it clear that FMEAs are comprehensive, analytical and fact-based. But, change is hard and those of us who are very comfortable with current FMEA methodology may feel like we are learning a new language as we cut our teeth with the new process. Given the time and effort put into creating this new methodology and updated document, it is unlikely that major changes will be made to the overall process based on comments received over the next few months. So, we are digging into the Handbook with the expectation that this will become the new normal for FMEAs in the automotive industry. It is important to note that the Handbook’s title is the 2018 AIAG-VDA FMEA Handbook and 2018 is now just around the corner. While we haven’t seen a firm implementation deadline, we have heard that automotive suppliers are expected to have the new methodology in place sometime after September 2018. 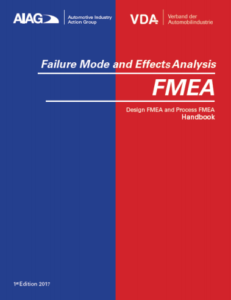 We plan to have an FMEA training course on the new methodology available as soon after the final publication of the handbook as possible. Join our maillist if you want to know as soon as our training is available or if you would like to receive updates on our interpretation of the changes. In the meantime, we are happy to report that some of the improvements highlighted in the new Handbook have always been a part of how we teach FMEAs in all of our existing courses. You can get a sneak peek at this new manual as well as provide input during the comment period. You need to have an account with AIAG, to download the free FMEA Handbook draft, but you can easily create a new account if you don’t already have one. 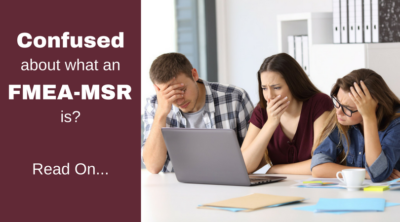 What is an FMEA-MSR? Here are some quick answers.